Ingrid Betancourt will be at Town Hall tonight to speak about her latest memoir Even Silence Has an End at 7:30 p.m. Tickets are $5. Many may remember Ingrid Betancourt's risky and dramatic rescue by the Colombian army back in 2008 after her six and a half years of captivity with the Revolutionary Armed Forces of Colombia (FARC). 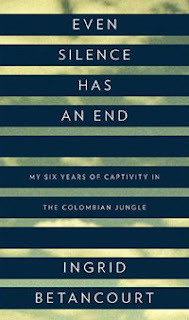 Regarded as one of the most well-known political hostages of all time, Betancourt details her astonishing struggle to survive 2,321 days of captivity in the Colombian jungles in her latest tell-all memoir, Even Silence Has an End. Chilling, surreal and at times devastatingly heartbreaking, Betancourt's journey is nothing short of extraordinary. Reading more like fiction, the memoir is being haled as "a classic of Colombian history and literature"; and it's most definitely one story that will keep you up late with its nail-biting and emotional accounts of survival. Early on in Silence, we meet then-Colombian senator Betancourt as she is on the presidential campaign trail in February 2002. Her father has fallen ill and she is apprehensive about leaving his bedside to travel to the northern town of San Vicente del Caguan, where then-President Andres Pastrana had just ordered that a FARC safe haven be dismantled after failed peace negotiations. The military refuses to give Betancourt armed military escorts yet she insists on completing the trip with her then-campaign manager and later fellow captive, Clara Rojas, and two journalists. Thirty miles into the trip, the group is abducted at gun point. Dinaw Mengestu will be reading from his latest novel How to Read the Air tonight at the Seattle Central Library at 7 p.m. This event is free. We will be the first to admit that we did not read Dinaw Mengestu's highly-acclaimed debut novel, The Beautiful Things that Heaven Bears. However, with having just finished his second novel, How to Read the Air, we're also very happy that we hadn't.Those who have read both, seem to generally have one of two views: that either the second novel was a great follow-up to the first; or that it wasn't as good in comparison. And really, second novels are tough--especially when they are following shortly after a debut such as Beautiful Things, which was named as a New York times Notable Book for 2007; won the National Book Foundation's 5 Under 35 award; The Guardian First Book Prize and locally, was named as the 2008 selection of the community reading program, Seattle Reads. "They called the trip a vacation, but only because neither of them was comfortable with the word 'honeymoon,' which in its marrying of two completely separate words, each of which they understood on its own, seemed to imply when joined together a lavishness that neither was prepared to accept. They were not newlyweds, but their three years apart had made them strangers. They spoke to each other in whispers, half in Amharic, half in English, as if any one word uttered too loudly could reveal to both of them that, in fact, they had never understood each other; they had never really known who the other person was at all." Hugo House and Seattle7Writers are teaming up to feature The Novel: Live! this week, beginning today at 10 a.m. with author Jennie Shortridge. 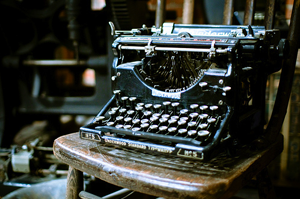 For six full days, the public will get to cheer on 36 of their favorite Northwest authors in the Hugo House's cabaret as they each take their turn at the keyboard in this marathon writing session to complete a full-length novel. And for those who can't make it out to see their favorite writers working live on stage, you're in luck--The Novel: Live! website will include live streaming and chat capability. On top of being able to see all of your favorite authors busy at work with their craft, the Hugo House will be featuring a happy hour each day from 5-7 p.m. with drink specials, free food, raffle prizes and Seattle celebrity emcees such as Nancy Guppy, Warren Etheredge, KEXP's Kurt B. Reighley and singer/songwriter John Roderick. There are some fantastic local writers featured on the schedule, including Kathleen Alcala, Ed Skoog, the H.H's own Karen Finneyfrock, Elizabeth George, Stacey Levine, Frances McCue, David Lasky, 826 Seattle's founding director Teri Hein and so so so many more. And to help the writers with any small cases of stage fright, each will be granted three "lifelines" where they will be able to call other writers, friends, their agents and so on. Seattle's favorite librarian and beloved Book Lust author, Nancy Pearl, will as well be on hand for encouragement each day, as the Novel: Live! 's "fairy god-author." Like us, you might be wondering: how the hell will this work, exactly? Considering that some of these writers are mainly known for poetry, or graphic novels, and yet others are award-winning prose authors, it'll be exciting to see the final project and what comes out of this possibly insane creative process, to say the least. Will it be a mishmash, will it flow correctly... will it make sense? No one can tell for sure, but we'll just have to hunker down at the Hugo House and watch how it all unfolds. Part of the fun, yeah? And as an added bonus for all of the writers in the audience cheering on their favorite authors, The Novel: Live! may just be the inspiration you were needing to help prepare you for November's National Novel Writing Month (NaNoWriMo). For those unfamiliar with NaNoWriMo, the premise is simple: writers are encouraged to take a "seat-of-your-pants" approach to their craft and complete a 50,000 word, 175 page novel by midnight on November 30. No big deal, right?! For all of you partaking this November, we give you some serious props and overall, encourage you to get out this week to see all of the writers at The Novel: Live! take on a similar task, only instead as a collaborative effort, and you know, less than a week to finish. Allison Hoover Bartlett will be in town this this weekend to read from her latest non-fiction Bibliomania mystery, The Man Who Loved Books Too Much: The True Story of a Thief, a Detective, and a World of Literary Obsession. Bartlett will be at Elliott Bay Book Company today at 4 p.m. and at the Seattle Antiquarian Book Fair in booth 303 with the self-acclaimed "bibliodick" himself, Ken Saunders on Sunday, from 11 a.m.-1 p.m. Tickets for the Seattle Antiquarian Book Fair are $5 and can be purchased at the door. Journalist Allison Hoover Bartlett describes in her non-fiction debut novel, The Man Who Loved Books Too Much, that according to the Antiquarian Booksellers' Association of America, there are five specific profiles for rare book thieves: those who steal for profit; those who steal in anger; the casual thief; and those who steal for their own personal use. Know thine enemy. Bartlett's real life account of rare book thief John Gilkey and the Utah rare book dealer and self-appointed "bibliodick" Ken Saunders who caught him, will leave book lovers astounded and most likely looking a little closer through garage sale or bargain bin books in the future. Bartlett takes us deep into not only the years that Saunders chased Gilkey around the country while he stole possibly up to $300,000 worth of rare books with stolen credit card numbers, but also into a world where Bibliomania is the main stream, dust jackets are described like beloved children and many would sell their soul for a first edition copy of J.D. Salinger's Catcher in the Rye. Ken Follett will be at Town Hall tonight to speak about his latest historical epic novel, Fall of Giants, at 7:30 p.m. Tickets are $5. If there is one book, overall, that we could recommend to read this fall, it would hands down be Ken Follett's ambitious new novel, Fall of Giants. Granted, we are a total sucker for historical fiction AND the early 20th century just happens to be our favorite time period... But regardless, this first volume of the Century Trilogy is absolutely outstanding. Many first fell in love with Follett while reading his international bestselling novel The Pillars of the Earth, now also a television miniseries. Pillars spent twenty-six weeks on the New York Times bestseller list; London's The Times asked readers to vote for the 60 greatest novels of the last 60 years and Pillars came in at number two, right behind To Kill a Mockingbird; and in Germany, Pillars was voted the third most popular book ever written, trailing only behind Tolkien's The Lord of the Rings and the Bible. After finishing the Pillars sequel, World Without End, nobody could have imagined the astonishing masterpiece that Follett would take on next; it seemed he had already conquered the unbelievable. Fall of Giants, the first volume of the Century Trilogy that will cover all of the 20th century's greatest events ending with the Cold War, weaves together five families as their lives are uprooted and transformed by the Russian Revolution, the women's suffrage movement and WWI. Described as "on a scale that is at once, panoramic and intimate," we could not agree more. By choosing to include families from each of the countries primarily affected by the events surrounding WWI, Follett expertly details all perspectives and lifestyles of the time with an impressive ease. Fall of Giants is an extremely epic read, but we promise it is also one that you will be staying up late just to finish. As Fall of Giants covers WWI and the early 20th century, stay tuned for Book Two (2012), which will follow the five families' descendants and cover WWII, and Book Three (2014), which will cover the Cold War. Early on in your career, you were primarily known as a thriller writer and then you made a dramatic transition to historical fiction in 1989 with your international bestseller, The Pillars of the Earth. What inspired you to take on the Century Trilogy and the ambitious task of covering the entire twentieth century? After writing World Without End I wanted to write another book of the same sweep and length--but I didn't want to do another medieval story. It occurred to me that the twentieth century is the most dramatic and violent period in human history, and it is also the history of my readers and me, our parents and grandparents. So it's about where we all come from.